The Falcon Heavy Launch was a very unique experience and while my live stream didn’t work out, I did manage to capture the above video in 4k. Thankfully even the audio quality came out pretty good, especially if you wear headphones, but it was a very windy day. Due to the nature of the launch and how everything lined up, I wasn’t able to secure an ND filter to drop the shutter speed of the camera to film the launch so I had to use f/32, which is why you see every little speck that got blown onto the lens throughout the long day. I tried to keep it as clean as possible, but it was difficult with how high I had to mount the cameras in the air (almost 7ft high). The Sony a7RIII preformed flawlessness and I am very impressed with the performance of the Sony 100-400mm+1.4TC. 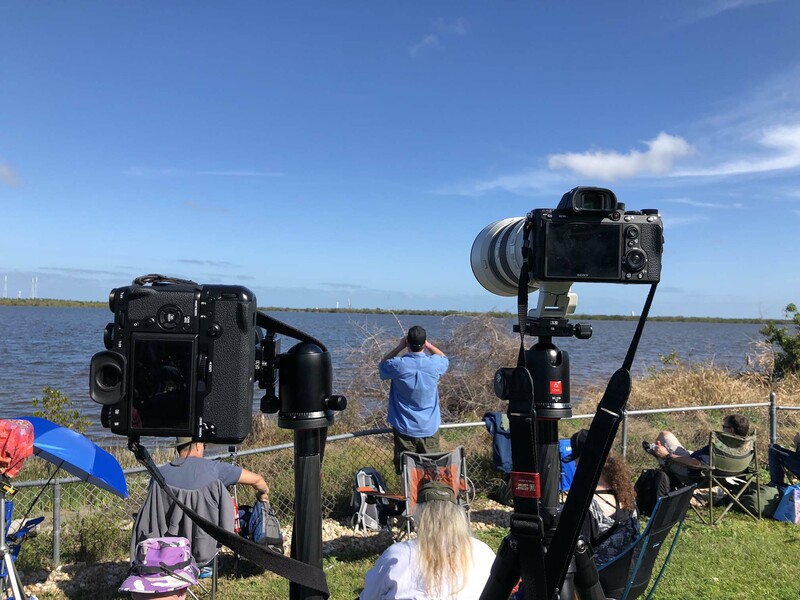 They gave me more than enough reach to shoot the Falcon heavy from the 4-mile viewing area, but that area is less than idea for photographing a launch because the platform blocks the rocket. I was really hoping to use the Fujifilm X-T2 to get roughly 1200mm of reach with the Fujinon 100-400mm+2xTC to shoot the rocket on the launch platform, but you simply can’t see the rocket behind the platform when it’s on the ground. So I framed up the Sony a7R3 and X-T2 so that the rocket would fill around 1/3 of the frame as it ascended. I could zoom in more for photos than video for the framing I desired so I could have used the Sony 70-200mm+2xTC, but I really wasn’t sure what to expect shooting from the 4-mile mark and wanted to be safe. Maybe next time I shoot a launch I will take photos with the Sony and video with the Fujifilm, but I really wanted to do three things and only one ended up being a falure so not bad. It would be amazing to get to shoot this launch from one of the official photographer areas with some direction about where to look. The 4-mile viewing area lets you see everything including part of the boosters landing, but unless you know where to look it happens too fast to photograph. From where I was sitting the boosters landed off to my right behind the bushes so I would have had a split second to catch them. I tried right after I saw them stop and lower, but it was too late. The 6 sonic booms that follow them landing is pretty intense too. The package was definitely worth the price and my kids even got to meet Bill Nye before NASA security told everyone they had to sit down. NASA is definitely not used to these kinds of crowds anymore and there was a lot of confusion. Most of the people we dealt with were very helpful and I actually had a really amazing spot before the final one I ended up in because an employee asked me to move. Now let me be clear I checked with 4 employees before setting up my cameras and they all said where I wanted to setup was fine, heck they even filmed my kids having a good time and asked me to sign a release so they could use the footage, but after about an hour they asked me to move so I ended up in a worse spot than I otherwise might have if I had received proper direction, to begin with. Launch photography is a lot of fun and is uniquely challenging because depending on the angle you shoot from there are atmospheric conditions to take into consideration and when they start fueling the rock there is outgassing around the rocket that causes things to get a little wavy depending on conditions and angle. In the future, I would like to shoot this again at night and maybe arrive 2-3 hours earlier than my placard says to pick a prime spot to shoot from. I think I would keep my equipment pretty much the same as what I brought with me, but maybe I would try the 50-140mm+2xTC with my Fujifilm X-T2. In the coming Days/Weeks I will post more to Instagram / 500px / YouTube so subscribe/follow them if you’re interested in Falcon Heavy and Space X. Also don’t forget to follow SonyAddict on Facebook and Twitter. This entry was posted in Editorial, Sony a7RIII and tagged 100-400, Falcon Heavy, Fujifilm X-T2, FujiFilm XF 100-400mm f/4.5-5.6 R LM OIS WR, Fujifilm XF100-400mm, Fujinon XF 100-400mm f/4.5-5.6 R LM OIS WR, Fujinon XF100-400mm f/4.5-5.6 R LM OIS WR, FUJINON XF100-400mmF4.5-5.6 R LM OIS WR, Rockets, Sony a7RIII, Sony FE 100-400mm f/4.5-5.6 GM OSS, Sony FE 100-400mm F4.5–5.6 GM OSS Super Telephoto Zoom, Space, Space X. Bookmark the permalink. Trackbacks are closed, but you can post a comment.